This national survey by the Pew Research Center, supported by the California HealthCare Foundation, explores how adults with chronic conditions gather, share, and create health information, both online and offline. However, chronic disease seems to play an independent role. Logistic regression analysis indicates a “diagnosis difference” that is tied to several aspects of health care and technology use. Holding other variables constant (including age, income, education, ethnicity, and overall health status), the fact that someone has a chronic condition is independently associated with being offline. For example, the last time they had a serious health episode, people living with chronic conditions were more likely than the general population to tap into the help offered by health professionals, friends and family, and peer patients. Holding other key variables constant, living with a chronic condition increases the likelihood that someone will seek advice, information, or support from all three sources. Those observations hold when controlling for age, income, education, ethnicity, and overall health status—all of which are also associated with doing health-related activities online. This echoes the Pew Research Center’s previous work in this area, which showed that, once someone is online, having a chronic disease increases the probability that they will take advantage of social media to share what they know and learn from their peers.11 Other examples of the diagnosis difference are noted throughout the report. 25% of U.S. adults say they are living with high blood pressure. 13% of U.S. adults say they are living with asthma, bronchitis, emphysema, or other lung conditions. 11% of U.S. adults say they are living with diabetes. 7% of U.S. adults say they are living with heart disease, heart failure, or heart attack. 3% of U.S. adults say they are living with cancer. We find that one in four U.S. adults (24%) say they are living with one condition. One in five U.S. adults (20%) say they are living with two or more chronic health conditions. This second group is considerably different from the rest of the population in terms of age, education, health status, and technology use. The table below shows the distribution of health and disease in the population of U.S. adults as a whole. When controlling for age, income, education, ethnicity, and overall health rating, having at least one chronic condition significantly increases the likelihood that someone will have faced a serious medical crisis, gone to the emergency room or been hospitalized unexpectedly, or experienced a significant change in their physical health in the past 12 months. For example, 26% of adults living with two or more conditions say they faced a serious medical emergency in the past year, compared with 12% of those who have one condition and just 4% of adults who report no chronic conditions. People living with chronic conditions are also more likely to be caring for other people. Forty-two percent of U.S. adults living with one or more chronic conditions are currently caring for a loved one, either an adult or child. By comparison, 37% of U.S. adults who do not have a chronic condition are caregivers13. People living with chronic health conditions continue to lag behind other U.S adults when it comes to information and communications technology adoption. 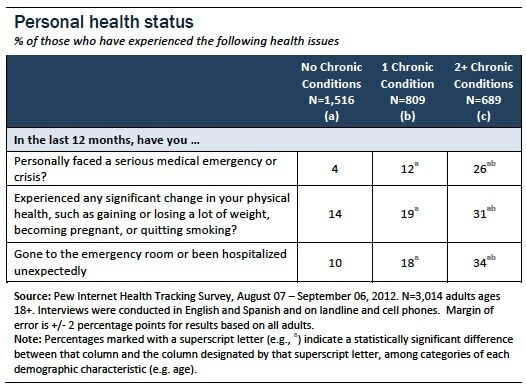 Of those who are living with chronic health conditions, 72% say they have access to the internet. By comparison, 89% of those who report no significant health problems say they have access. Pew Research Center studies also show that education and age are strongly correlated with having internet access. Yet when age and education are held constant, living with a chronic disease independently increases the likelihood that someone will not have internet access. The more conditions people are managing, the less likely they are to have internet access: 80% of adults living with one condition have internet access, compared with 61% of those living with 2+ conditions. There is also a gap when it comes to cell phones: 78% of U.S. adults living with chronic health conditions said they own a cell phone at the time of the survey, compared with 91% of those who report no conditions. This ratio has not changed significantly since 2008, when 76% of adults living with chronic conditions reported that they own a cell phone, compared with 89% of those who do not have any chronic conditions. Living with a chronic condition is not a significant factor in predicting someone’s likelihood to own a cell phone. Statistical analysis shows that the gap is better explained by the fact that people with significant health challenges are more likely to be older, living in lower-income households, and reporting a lower level of formal education. Age, income, and education level are all strongly correlated with cell phone ownership.